Daily Otter followers will remember little Luna, the sea otter pup formerly known as pup 681, who was rescued in California and found her home at Chicago's Shedd Aquarium. She's a little more grown up now, and has a new favorite toy: a basketball! 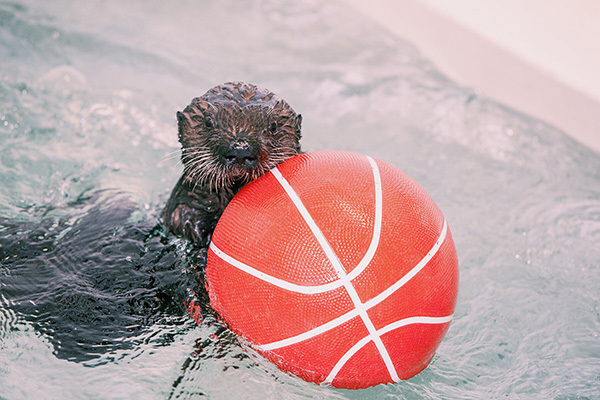 Shedd Aquarium’s rescue sea otter pup, Luna, is getting in the March Madness spirit thanks to a basketball enrichment toy! Doing her own form of dribbling, Luna enjoys swimming with her basketball, diving next to it and even resting on it as she enjoys an ice treat. She’s a top contender for a place in our hearts! Currently weighing in at 24 pounds, Luna is growing up fast and can be ranked as one of Shedd’s most adorable teammates. She is learning new behaviors every day, including jumping in and out of the water on cue, and learning her training shape – a yellow star. Luna, an orphaned California sea otter, arrived at Shedd on Oct. 28 when she was just 5 weeks old and weighed less than 6 pounds. Since her arrival, she has been receiving around-the-clock care behind the scenes from Shedd’s sea otter specialists and veterinarians. Luna was rescued along the southern California coast by state wildlife officials and taken to Monterey Bay Aquarium, a leader in sea otter rehabilitation. Shedd, with 25 years of experience in caring for fragile sea otter pups, quickly accepted Monterey Bay’s call to provide the tiny orphan with a permanent home. Click here for our previous posts on Luna! Thanks to Shedd Aquarium; photo ©Shedd Aquarium/Brenna Hernandez.